Jentink's duiker is a small forest antelope that weighs up to 70 kg (150 lb). It spends much of the year in unpopulated interior hills covered with primary forest where it feeds on forest fruits. However, during the rainy season, between May and October, forest trees produce few fruits, and at this time Jentink's duiker leaves the forest and makes use of forest edges, secondary growth, scrub and farms to feed. In addition to fruit it feeds on shoots of shrubs and young trees, palm nuts, mangoes and cocoa pods. Jentink's duiker is nocturnal. During the day it hides in a hollow tree, fallen tree trunk or the buttress bay of a kapok tree. Jentink's duiker is either solitary or occurs in pairs. It is reported to be territorial, with both members of a pair defending the territory. Jentink's duiker was already considered rare in 1888. Since the 1960's it has been thought to occur in Cote d'Ivoire (southwestern forests), Liberia and Sierra Leone. Within this region it is only found in the few remaining areas of undisturbed forest. It is shy and secretive, and it may be less rare than it was thought to be in the past. Threats include loss of its forest habitat due to logging as well as hunting by loggers' employees, commercial bushmeat hunters and native people. *** A study conducted in Sierra Leone found that most people are unaware of the rarity of Jentink's duiker, and even local hunters claim not to realize that it is protected by law (Davies & Birkenhager 1990) . *** Jentink's duiker is so secretive that it continued to survive less than 30 km (20 mi) from Freetown, a city of half a million people, hiding on steep, densely forested slopes in the city's water catchment area. *** Jentink's duiker is occasionally found at the seashore, presumably seeking to obtain salt. *** When alarmed, duikers quickly seek protection by "diving" into dense vegetation; thus the origin of their name, duiker, which means "diving buck" in Afrikaans. 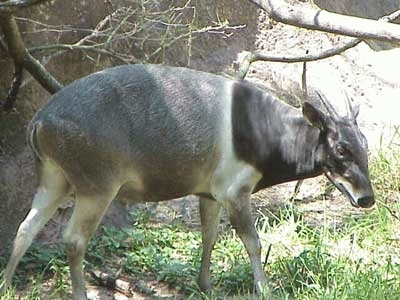 Jentink's duiker was already considered rare in 1888, although it was reportedly common in Sierra Leone at the turn of the century. Since the 1960's it has been thought to occur in Cote d'Ivoire (southwestern forests), Liberia and Sierra Leone. It is found only in the western part of the Upper Guinean forest block, which stretches from eastern Sierra Leone through Liberia and southern Cote d'Ivoire into southwest Ghana. Within this region it is only found in the few remaining areas of undisturbed forest. It is shy and secretive, and it may be less rare than it was thought to be in the past (East 1990) . Jentink's duiker weighs up to 70 kg (150 lb). Jentink's duiker spends much of the year in unpopulated interior hills covered in evergreen rainforest. However, during the rainy season, between May and October, forest trees produce few fruits, and at this time Jentink's duiker makes use of forest edges, secondary growth, scrub and farms to feed. A diversity of fruiting trees and dense forest for shelter appear to constitute basic habitat requirements. Females: 9 - 12 months; males: 12 - 18 months. It has been reported that young are usually born between March and June, and that young calves are usually seen between November and January (East 1990) . There is 1 young per birth. A young Jentink's duiker is weaned by 5 months. Jentink's duiker is nocturnal. During the day it hides in a hollow tree, fallen tree trunk or the buttress bay of a kapok tree. If discovered, it bolts from its hiding place with great speed, but it is not able to run very far. At night it travels out of the forest, especially during periods when forest fruits are scarce. Jentink's duiker is either solitary or occurs in pairs. It is reported to be territorial, with both members of a pair defending the territory. It appears to occur at relatively low densities (perhaps about 1 individual/sq km (about 3 individual/sq mi)) even under favorable habitat conditions (East 1990) .